You must be logged in to participate! Today we proudly present two limited edition posters from twenty seven year old illustrator Peter O’Toole. Hailing from Huddersfield in Northern England, he shares his original name with a famous Irish actor (although he insists he was named after his grandfather and not the actor) which is a bit of a problem when you’re trying to get to the top of the SERPs (search engine results pages, such as Google), as he is. Thus, for a while Peter thought of using a pseudonym, more specifically “Slugger O’Toole”, which was ‘borrowed’ from a famous Irish folk song, the Irish Rover. But alas, this name was also taken by someone ‘bigger than Pete’ and therefore ‘higher than Pete’ in the SERPs (running a Northern Irish political blog) so he eventually just went for Peter O’Toole illustration, which, in his words “works just fine”! Recently married, no kids (yet), and bearing leanings towards the British casual scene, which, lovely enough, includes one of our favorite subject matters: vintage adidas trainers! 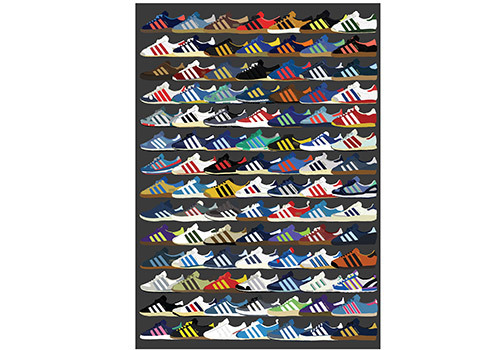 O’Toole busted out these two lovely posters depicting a variety of OG vintage City and Island series adidas trainers for love of the community, and in that same spirit eatmoreshoes has nabbed up a single copy of each (in A1 size) to give out to our lovely fans. Be quick though, the contest ends on April 30th, 2013, at 12 o’clock midnight, TCT (that’s Terrace Classics Time). Simply enter above for your chance to win and read on below to learn more about the visionary behind these (and many other) great works of adidas-inspired art. Everyone’s got one Slugger, so tell us, what’s your ‘trainer story’? I started collecting back in about 2003 I think. I had recently left school and starting going around with football lads who I went to school with (their older brothers where already knocking around with older football lads so it was a natural progression). And everyone was wearing Paul & Shark, Stone Island, Aquascutum, Burberry, Henri Lloyd, and adidas trainers or Rockports. I went for adidas trainers, and although I’m no longer involved with the ‘casual’ way of life I have taken a few things with me: the trainers and the jackets! And illustration, obviously not one of the many facets of casual culture (at least not typically), what’s the path you took in that field? Illustration was always the plan, even when I didn’t exactly know what the word ‘illustration’ entailed. I knew that’s the direction I wanted to go in so I made the necessary steps and sacrifices to get there. There was a few forks in the road here and there but ultimately I went to art college and then to University to get a degree. Then in 2010 I went freelance which is where I am today! Boy are we glad you made it there Slugger! Now, combining the two parts of your life (casual culture or more specifically adidas trainers, and illustration), tell us how you dreamed up this first poster? I always thought there was a gap in the casual market, but I didn’t want to just be doing logos for football firms or anything like that. I wanted to aim more at the fashion side, which is the side I’m interested in. So as a side project when I had a quiet week here and there I just started drawing trainers and adding to it. I always had a fascination for the City series so I decided that was a good place to start. And the second poster? What inspired that? It took a year to find time to finish the first poster, and I thought a few old school adi heads might appreciate it, but what I got was an amazing, overwhelming response. I got about two hundred new friend requests on Facebook from all over the world in the space of about two days! Anyway, I realised I had left a few classics out (Köln specifically), so I committed to doing another one featuring the island range as well as the majority of the rest of the City series. So I took another year to create it and made it a limited edition print, with only one hundred available for purchase. What’s the creation process like? Long! Drawing every stitch and detail on one hundred and ninety eight models was very time consuming. But had I not had archives of images saved up from the previous decade of adidas addiction it would have been a lot longer! I still had to research a lot, sourcing images of some models was nigh on impossible. I think one I had in my archives that I couldn’t find online was the adidas Michigan on the first print. And the image I had was very low res! Do you find inspiration from any other artists in particular? I try not to look at other artists in that way at all. I think even if it’s subconsciously your work starts to look like theirs in some form or another when you do that. I try to take inspiration from music or films or anything else really! I can walk down the street and see a boarded up window and think the textures on the board would look good as wear and tear on my next poster! It’s weird where my inspiration comes from but I have to be open to it. Certainly, and it seems that you are are indeed. Do you have any other shoe-related projects on at the moment? Got a couple! 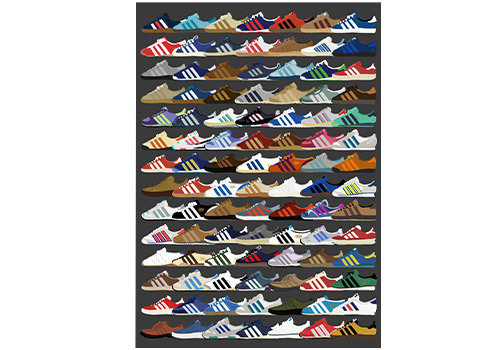 I’m looking at doing a very special poster with Quote (a big time vintage adidas collector from Berlin), illustrating some of his collection. We’re going to try get adidas involved with it as he has good ties through his ZX 500 model (and we both have links to adidas in London). As well, adidas Russia sponsored an art show I did in Moscow just last weekend. It’s not strictly trainer based but it’s going to be casual based to cover a broader spectrum of the culture. Very cool, we are excited to see how both endeavours turn out. Art aside, how’s your personal collection, can you tell us a bit about it? I’d describe my collection as ‘mature’. As a kid I would buy anything, mainly City Series re-issues. But as a student and starving artist I had waves of selling trainers to pay rent over the years, so if any survived you know they’re only the good crop! Now I’m a bit more established and settled and I buy but I’m a lot more specific. Nowadays I only buy OG, and I’m also a bit sporadic. For example I only bought one pair of trainers (Riveira) in 2011 and 2012 and swapped for some French Tobacco. Yet in the first month of 2013 I bought Valencia, Rom, and Nadi. Hopefully I will keep up the momentum! I have a few very special pairs of adidas Dublin that you can read about in the Chris Law interview. I think a few of my friends wouldn’t mind me putting them up for sale! Gotta be the classic OG European City silhouette. adidas just can’t seem to get the shape or quality with the re-issues. And my OG are still holding up thirty years down the line. What about elusive silhouettes and holy grails… what don’t you have that you’re chasing? There’s one pair, I’m sure everyone’s seen them, though they are unnamed as far as I know, a City Series silhouette, yellow body with orange stripes. Those things are beauties. I would also like to own some Tahiti and Amsterdam but I wouldn’t say they are grails any more. Ambitions all around, whether it be trainers or art projects or collaborations with big brands, it’s obvious who to go to if you’re a trainer head and in need of a supreme illustrator. Peter O’Toole can be found online at his website, on Facebook, Twitter, and Instagram, so don’t be shy if you like what you see. And speaking of the posters, don’t forget to enter the contest as we’ll close the door for entries by midnight of April 30th, 2013. Thanks again, so much, for joining us Slugger, we wish you the best in your future works!